Yikes....time flies when your having fun! Went to the pool yesterday with my son, and today I went to school where it was nice and quiet...no summer school classes on Friday! I just came back from the energy fair and so my mind is on how to add an energy component to my science classrooms in some way. I figure that we could probably add a bit of energy science into our fourth grade curriculum as we continue to add more emphasis on the NGSS science standards. That...my friends...is now on my summer bucket list. Energy. Take a look a the great book I found to guide me and the resources I bought at the event. So, thanks Deanna for this fun linky! Solar bugs, solar cell with motors, and even UV sun detectors! Stations, here we come! Simple reading and fun pictures! 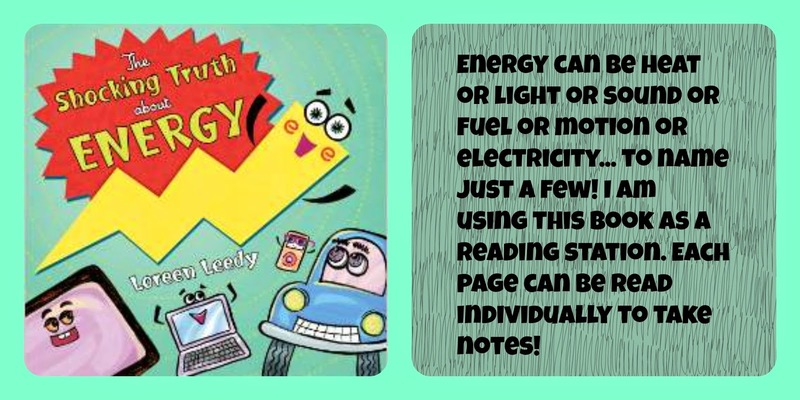 Easy to copy and place at a station for kids to read and take notes! I hope I have the ENERGY to do this next week! It is always fun to find a good book that excites you about Science! This one did.